A few days ago it snowed 15 inches on the Grand Canyon, and now after two glorious sunny days, it is preparing to snow again. The large dinnerplate flakes began falling just an hour after this picture was taken. The last of the sun fades under the encroaching clouds. At 7,000 feet, winter in the Canyon does bring snow and very chill air. 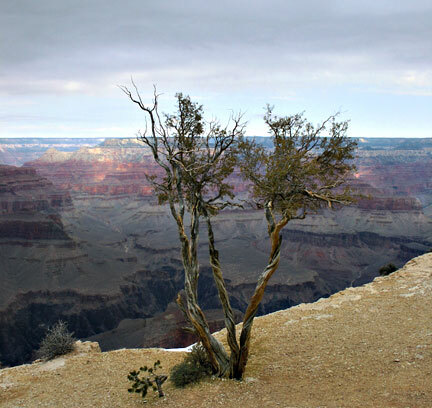 From Maricopa Point, the colors of the Canyon's fantastic rock layers stand out prominently, even on an overcast winter day. We are standing upon the brightness of Kaibab limestone. 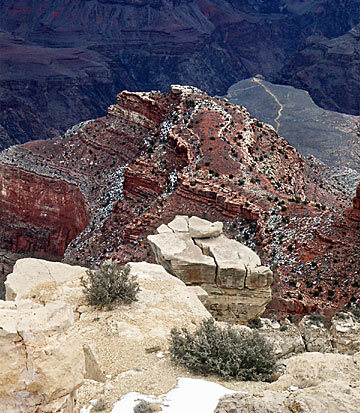 Looking downward, you can see the piece of the Bright Angel Trail that visits spectacular Plateau Point, a 12-mile roundtrip hike. The Point is 2400 ft. below us--- but still 2300 ft. above the Colorado River itself. Using normal temperature estimation formulae, since it was a chilly 36 degrees where we stood at 7,000 ft, the Inner Gorge at Phantom Ranch was likely enjoying a pleasant 52 degrees! Here are further geologic notes: the rock upon which we stand to take this picture is already old, dating from before the Age of the Dinosaurs. But Plateau Point is twice as old, being in the zone of the Bright Angel Shales/Tapeats Sandstone, 500 million years old, dating from the Cambrian Period of geologic history. Standing on Plateau Point, you are touching rocks formed at a remote time when the only life on Earth was water life, and the highest creature was the lowly Trilobite. The first small land animals were 100 million years into the future! And then gaze downward from Plateau Point into the darkness of Granite Gorge and see the rocks of the "Metamorphic Suite," an incomprehensible three times older than the Tapeats! These Inner Gorge rocks are some of the very oldest exposed rocks to be found on the face of our Planet (in my photo image, look at the dark rocks just above the end of the Plateau Point trail, and you're looking at these ancient Pre-Cambrium rocks). brucej@oregonphotos.com as your message recipient.